Three moons? Get your vision checked. If Mike Oldfield is known for anything, it's his 1973 album "Tubular Bells", which consisted of only two songs spanning over twenty-five and twenty-three minutes in length. That album has been declared a classic. But what many fail to note is that Mike Oldfield didn't pass away after that was published; he's come out with almost twenty other albums since then, being quite prolific and still enjoying his craft. We're going to take a look at a strange one, 2002's "Tr3s Lunas", and figure out why you should give this one an open ear. First up is Misty, and no, we're not talking about the Pokémon character. We're talking about actual mist in the air, and this is a song not to be mist... missed... must listen. Relaxing square waves start out the album on a chilled note alongside some other fun new age sounds, including a guitar, though I'm inclined to believe it's not real. And then that saxophone hits... and you simply KNOW it's not a real saxophone. No saxophone ever sounded quite like a falcon caught in a fish net. It's not terrible, but it separates the song into definite fromage territory. Still, the song is pleasant enough, and a decent start to a chill-out album such as this. Next is No Mans Land, and it starts out more like a theme song to some Unsolved Mysteries rip-off, desolate and searching desperately for answers. The wailing guitar of Ibiza returns to sing its melancholy tale over equally triste pads. It's definitely decent background music for laying on the beach as the crimson sun sets for the evening. But it was Return To The Origin is actually the song that got me hooked on this album, having heard it played seemingly randomly through the house. That voice that says "Turn... return..." is a bit haunting as the hollow percussions subtly play in the background. The muffled soft guitar plays on as we slowly lead into organ pads and a very natural-sounding melody, one reflecting the peacefulness of nature at times. Definitely a highlight. Landfall is short and sweet, a piano and strings duet clocking in at a little under two-and-a-half minutes. The same chords are played repeatedly, but it always feels fresh, especially when electric guitars sneak their way in. Viper, even with a tough name such as that, is rather mild as well. At first, it comes off as a fairly standard offering, filled with pianos, pads, and his usual guitar. Oldfield uses female wails sparingly closer to the end, which adds a bit of unique flavour to this one, though it doesn't really stand out among the others. After that comes Turtle Island, boasting a deep and grunty bassline that underlies another new age guitar melody. That bassline feels rather organic, and though it's rarely at the forefront, you can feel its minimalist effects throughout the song. You also end up feeling the effects of Oldfield's signature faux sax (or "ersax", if you want a made-up term for it). Again, this is relaxing stuff. Next is To Be Free, the only song to have real vocals and lyrics, provided courtesy of Jude Sim, a vocalist about whom I can't find much information. This song reminds me of one of those "Heal The World"-type songs, looking for charity donations at the end. Or possibly a Coca-Cola commercial from the late 1980s. It's hard to pinpoint, but the vocals and hook are more of a detractor than a boon. I typically skip this song. Fire Fly is a song I can best describe as "plucky", because it's an uplifting plucky synth that sets the foundation for this little charmer. Once the pads slide their way in and the piano melody peeks in, there's no excuse not to feel more rejuvenated. Then we reach the title track, Tr3s Lunas. Notice the '3' instead of the 'e'? "Tres lunas" means "three moons", so... why not stick a three in there, just for kicks? This song wouldn't be out of place in a dusty Western town in preparation for a final showdown, owing to its basic and rustic bassline. This one definitely didn't stand out among the others, which is a shame, given it became the title of the album. Daydream is a piano piece that, in contrast to what was just heard, is a rather depressing song. At least until Oldfield's crooning fake guitar rears its head and turns it into something a little more cornball. Had it been left as just a piano-based song, it could've been excellent. As it is now, it's not quite as impressive. Getting closer to the conclusion of this journey, we have Thou Art In Heaven, starting out with a symphonic intro as a mysterious woman tells us we "art in heaven." Some odd instrumental choices, such as a very antiquated Atari bass and a filtered beat, really mess with our heads a bit, making us wonder what exactly Oldfield wanted to get out of this song. His Ibiza-style guitar helps to push it a little bit later on, but Thou Art In Heaven is a slight oddity compared to the other tracks in this collection. Sirius, the brightest star visible in the sky at night, is also a bit stranger than earlier tunes. 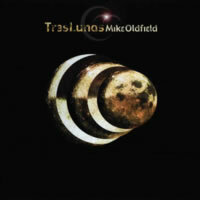 It is, as expected, more cosmic in tone, but soon becomes relaxing with an echoing piano and some more guitar work, staples in Oldfield's work, it seems. The song gets repetitive after a while, but it is rather tranquil, save for the clearly not-even-trying-to-sound-authentic seagull cries. Wait, are there gulls in space now? Not happy ones, I imagine. To finalize the album, we get No Mans Land (Reprise), an even more dreary version of No Mans Land, but with the cheesiest unreal saxophone I've found yet (outside of MIDI adaptations of anything). That crying guitar also eludes to absolute heartbreak in some fantastical movie character. And To Be Free (Radio Edit) is exactly that. I didn't care for the slightly longer version (only 30 seconds longer), so this addition at the end is more of a subtraction. Tr3s Lunas occasionally wavers in quality from the sublime to the dry, but for a chillout album, this is definitely one for the masses. It's a shame it didn't get the love it deserved. 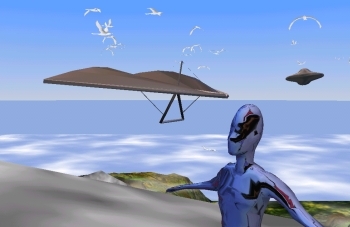 Tr3s Lunas was not only a music album, but also an experiment: the second disc of this set contains a computer game demo for "Tr3s Lunas", a program designed to combine Oldfield's music with a virtual reality environment. It's... something else. Just... something else.